My favorite feature in Lumenzia, by far, is the ability to customize any luminosity mask. This can make make it much easier to perform advanced retouching, such as removing the shadow in the tutorial video below. It also allows more precise retouching to make your images look stunning, without looking “Photoshopped”. You can increase or decrease inclusion of any tone or color in the image quickly an interactively. Whenever you preview a luminosity mask (such as L3, D4, vibrance, etc), Lumenzia creates a few temporary orange layers. These layers not only allow you to preview masks, but they can be adjusted to customize the mask in an infinite number of ways. Click on the mask presets (L2, L3, etc) or zone pickers to find the mask that best targets the area you wish to adjust. An ideal mask is relatively white in the target area, and relatively black in the immediately surrounding areas. Once you’ve found the closest match, you’re ready to customize. Target specific colors you wish to select (or deselect): just open the B&W adjustment layer at the bottom of the orange preview layers. You can simply move the sliders for the colors you wish to target, or click on the “targeted adjustment tool” (the little hand with arrows above/left of the red slider). With the targeted adjustment tool, you can simply click and hold on any part of the image, and then drag left and right to adjust how much the underlying color is used in the mask. Target the tones you wish to select (or deselect): open the curves adjustment layer in the middle of the orange preview layers. You can simply adjust the curve, or use the targeted adjustment tool again here to refine the mask. 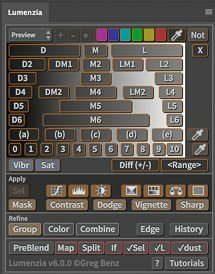 Drag curve points up to increasingly select (white mask) or deselect (black mask) specific tones in the image. For example, if you wish to protect the brightest highlights in an L4 mask, just grab the far right curve point and drag it down. Lastly, you may refine the whole mask using the levels adjustment layer at the top of the orange preview layers. This layer is most helpful when you have a complex curve, as you can use levels to adjust everything as a whole without having to move multiple curve points. Once you’ve created a custom mask, you can further refine it with the Group, Color, and other tools as you would with any other mask. There is literally no limit to what is possible.